MAWP 150 psi @ 450 deg. F. MDMT -20 @ 150 psi. all union connections. both tanks with temp & pressure gauges. cylinder actuated valve. Stand has fork pockets for moving. Chromalox 7.5 kw heater & temp control. Asco auto switches. 480 volts 3 phase. 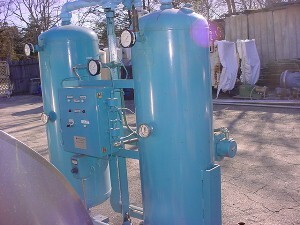 Has (2) 50 gallon pressure tanks, 18 inch x 4 ft.
Posted in Pressure Vessels, Blenders and Dryers.